Have an ear? Make it spicy! Hope everyone’s Friday is going well! Had a fun snack from Kirina’s table this week to post. I was thinking a lot about my mom, particularly since Mother’s Day is coming up (she passed away 8 years ago this June. I miss her loads, and miss her cooking just as much). We had a few rainy days here and it made me remember an Indian snack she used to talk about a lot from her childhood. She said she would eat it during monsoon season in India, a terribly wet and muddy time in Western India. I’m not sure what the official name of this snack is, but it involves fresh-roasted ears of corn and spices. My mom said it was a nice, warm, treat when you felt cold and wet from the rain. I thought Kirina would get a huge kick out of this snack (what kid doesn’t like eating things off a stick or a cob of some sort?) and also she could eat something from her grandmother’s kitchen and we could remember her that way. It’s an easy snack and there are variations with the spices. You know we are all about spices here when it comes to babies, toddlers, and adults! No one is too young to experience zesty food if you ask me. So here goes…try this out on your little one and see how it goes. 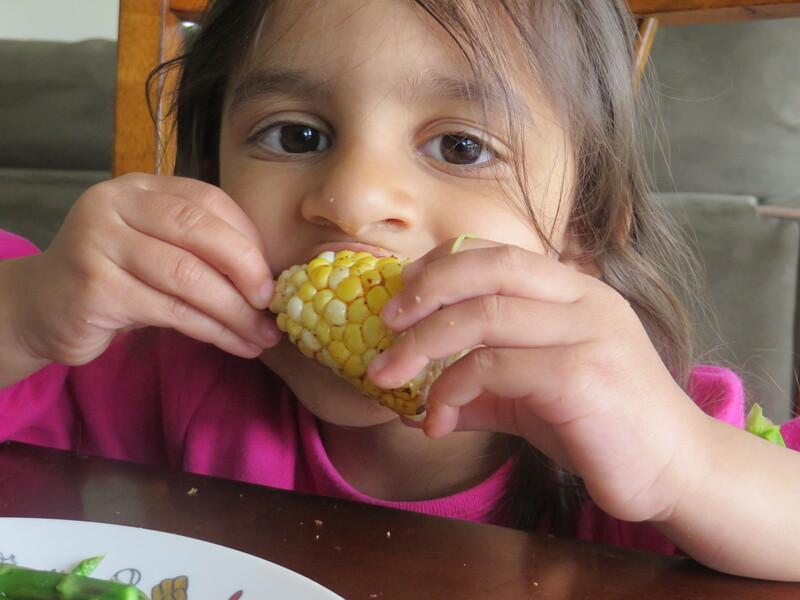 This one happens to be sweet Jersey corn (New Jersey is the Garden State after all. We are not just Newark Airport). 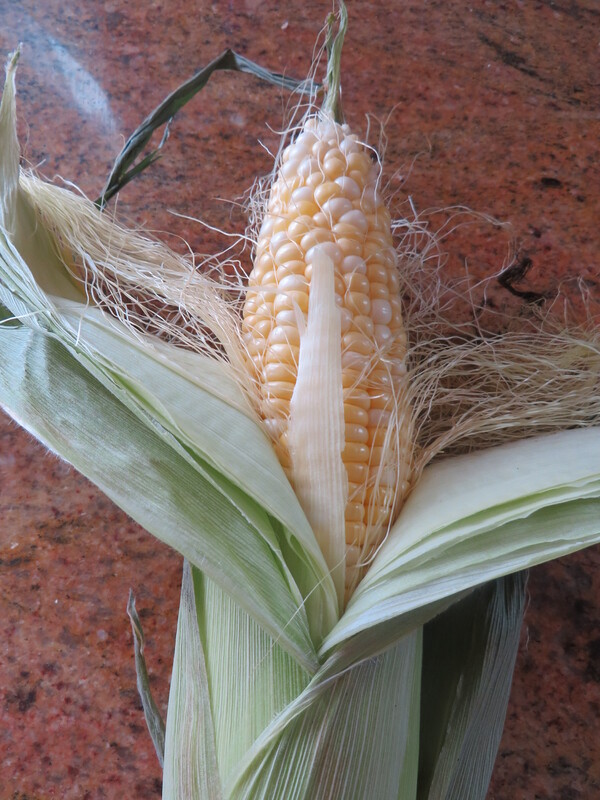 Make the corn naked (shuck the corn) and place on a medium flame on your burner if you have gas. You do this on an outdoor grill as well. And my mom only had an electric cooktop and somehow made it work too (stick to medium heat). Keep rotating the cob until you start to see browning (be careful not to char too much. though if this happens, it’s ok, just lightly rub it off with a paper towel). I told you it was creepy. 🙂 This is my grandmother’s cutting board. My grandmother! Her name is Gigi, and she is amazing. Anyway, what you see on the board is paprika, chili powder, salt and lemon. That’s all you need! 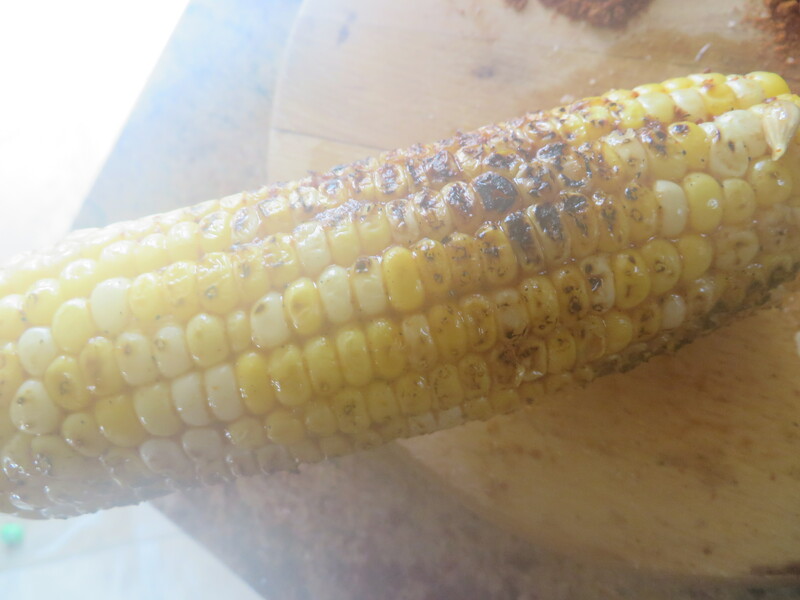 In a separate plate, take the roasted corn and rub all over with lemon first, then salt. And here is the variation…rub with paprika for a toddler just trying this snack out. Adults eat full-on chili, and so do children in India who are used to the seasonings. With Kirina I’ve started her on paprika because it is a mild chili flavor, and now we do a mixture of paprika and chili as she gets older. 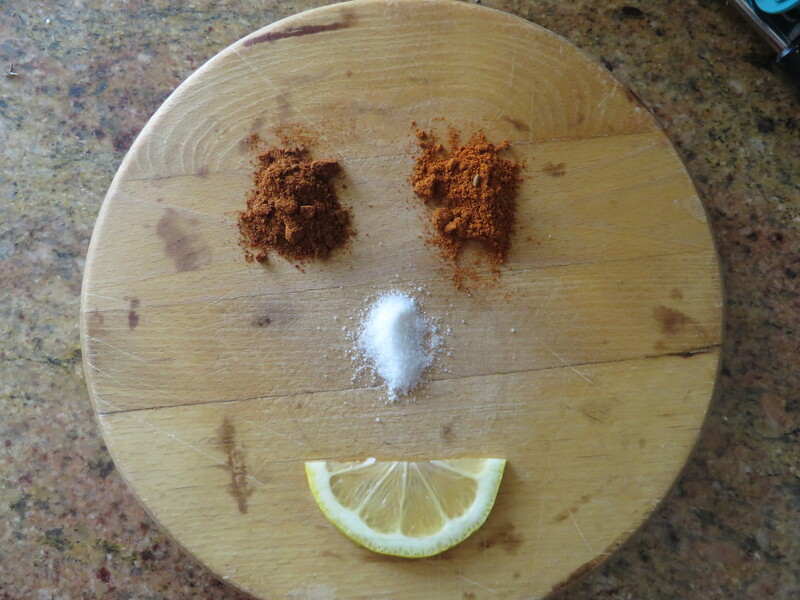 That’s the great thing with introducing your little one to spices…it’s easy! And you can vary the amounts and strengths as your little one gets older. The goal for us is always to expose Kirina to new tastes so she gets used to all the yummy flavors of the world. How did she like it? It was a hit! Though she didn’t like getting corn stuck in her teeth and we had some adventures with dental floss, but hey, I guess it got her to like dental floss and brushing more, so it was an added bonus! For you adults who are curious, this is a flavorful way to prepare corn without the fat of butter (even though butter is totally my best friend). Good luck and hope your little one finds it tasty. From Kirina’s table to yours, bon appetit! « Got milk? If you don’t read this!